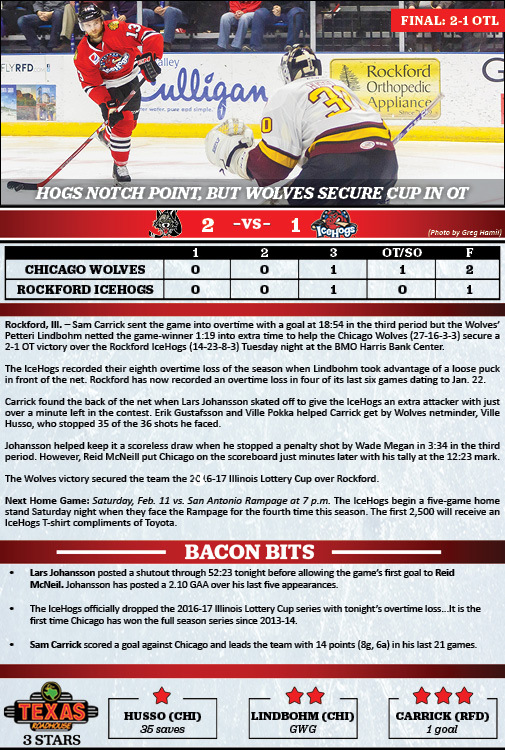 Rockford, Ill. – Sam Carrick sent the game into overtime with a goal at 18:54 in the third period but the Wolves’ Petteri Lindbohm netted the game-winner 1:19 into extra time to help the Chicago Wolves (27-16-3-3) secure a 2-1 OT victory over the Rockford IceHogs (14-23-8-3) Tuesday night at the BMO Harris Bank Center. The IceHogs recorded their eighth overtime loss of the season when Lindbohm took advantage of a loose puck in front of the net. Rockford has now recorded an overtime loss in four of its last six games dating to Jan. 22. Carrick found the back of the net when Lars Johansson skated off to give the IceHogs an extra attacker with just over a minute left in the contest. Erik Gustafsson and Ville Pokka helped Carrick get by Wolves netminder, Ville Husso, who stopped 35 of the 36 shots he faced. Johansson helped keep it a scoreless draw when he stopped a penalty shot by Wade Megan in 3:34 in the third period. However, Reid McNeill put Chicago on the scoreboard just minutes later with his tally at the 12:23 mark. The Wolves victory secured the team the 2016-17 Illinois Lottery Cup over Rockford.